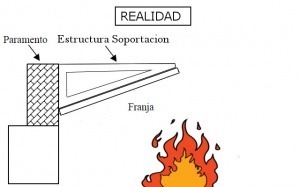 In this post we make a reflection on how to carry out a correct support of the different “Fire belt barrier systems bands” according to the Regulation of Fire Safety in Industrial Establishments (RSCIEI). The regulation does not say anything about it but we have seen on several occasions that it has taken as reference for this measure the end point of the fringe. In our opinion, for a constructive element, it seems more logical to take as a reference the midpoint of the strip as it appears in the graph. We must also remember that the marked meter is in horizontal projection, so if we install it in a leaning position, we will always have to calculate what length of strip we must place, since it will always be greater than that meter marked horizontally. A) Integrated in the cover itself, provided that the permanence of the strip is justified after the collapse of the parts of the non-resistant cover. 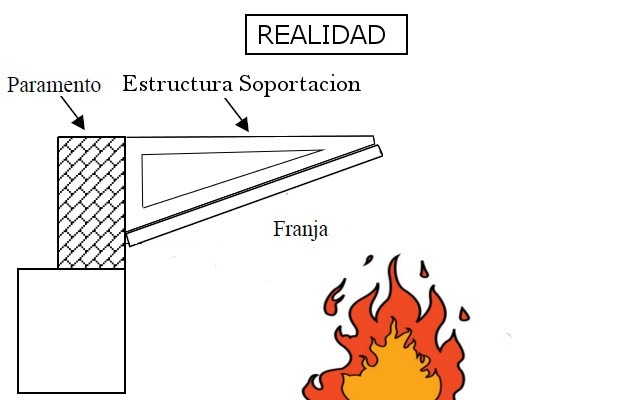 (B) Fixed in the structure of the deck, when it has at least the same fire resistance as the required strength of the strip. 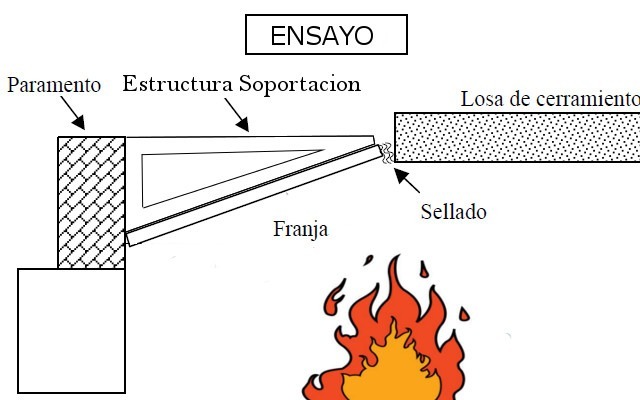 C) Formed by a barrier of one meter of width that justifies the required fire resistance and placed below the cover fixed to the Fire belt barrier. Option b): anchorage to the belts, it should only be used when we have belts that comply with the same load bearing capacity as the Strip. Here is where we have seen the main faults of strips installation: anchored to unprotected metal belts. We have even seen anchors to a roof type alumisol. Sometimes, when the distance between straps is greater than a meter, it is places the corresponding plate meter and leave part of the omegas of support visibly. This is done by ignorance or in order to save money, but they are totally unacceptable practices. Regarding the option c), it is the safest since the system is similar to how it has been tested according to the Protocol of Test of Fire belt barrier systems.